Rules are meant to be broken, and boundaries tested. Right? Maybe? Well, that could be why one daring Texas couple recently pushed Petco’s policy stating that “all leashed pets are welcome” to its limit by bringing their 1,600-pound steer in for a visit. Vincent Browning thought Petco’s policy was a “bluff,” so he led the massive animal into his local store to test it out, according to a post on his Facebook, and filmed the whole thing. He and fiancee Shelly Lumpkin brought the steer, fully trained to participate in rodeos and other events, to a Petco in Atascocita, Texas they frequent. In the clip, Browning can be seen leading the steer from the parking lot to the store, while a nearby child marvels at the animal. The clip shows Oliver maneuvering his massive horns, which measure an impressive 9 and a half feet from end to end, through the sliding doors and into the store without hitting anything or getting stuck. Browning repeatedly cautions Oliver to be “easy,” but as you can see, the steer appears to be cool with his shopping adventure. He was greeted with smiles from customers and employees and one worker even gleefully welcomed the farm animal to the store. 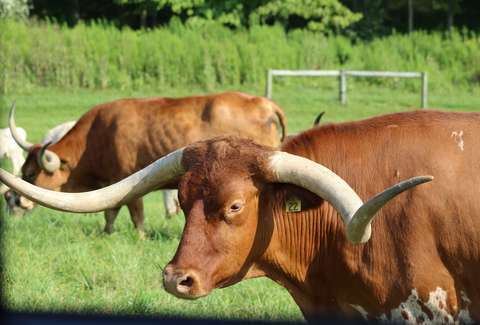 “They welcomed Oliver the African Watusi with open arms,” Browning said, per the Facebook post. Employees and customers took turns approaching Oliver to pet him and/or take photos. It’s not every day you see a steer in Petco, after all. According to a report by the Houston Chronicle, Browning and Lumpkin previously broached the idea of bringing Oliver in to the store, but didn’t act on it until early this week. Chrystal Armour, an employee at the store, told the Chronicle she previously spoke with Browning and Lumpkin about Oliver. The Petco worked recalled telling the couple she and her co-workers “would love to meet him,” and were welcome to come by with him whenever. Armour clearly didn’t think the pair would take her up on that offer, however, as she was shocked when Lumpkin suggested it. Video from Oliver’s Petco outing quickly went viral, even capturing the attention of the pet store chain’s CEO, Ron Coughlin. Cougling tweeted that he was “proud [and a little jealous]” that the Steer had been allowed in the Atascocita store, adding that he wished he’d been able to meet the steer himself. We have our doubts he would have been keen on cleaning up after the animal, however. You probably won’t see anything quite like Oliver the African Watusi on your next Petco run, but you can keep up with him on social media. He’s got more than 40,000 followers on Facebook, and stays pretty busy for a steer. Oliver even has a cute little pig friend named Dolly, whom he sometimes naps with, and let’s be honest… who doesn’t have room for something that adorable in their feed? We have a feeling Browning and Lumpkin’s little Petco stunt will lead to a lot more strange creatures popping up in Petco stores. Let’s just hope it doesn’t lead to animal chaos.